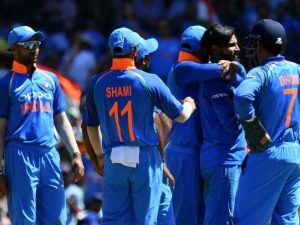 India beat Australia in the second One Day International match in Adelaide, taking the series to a 1 – 1 tie. Australia’s captain, Aaron Finch, won the toss, and opted to bat first. India won the ODI by six wickets with a result of 299/4 in 49.2 overs, compared to Australia’s 298/9. Shikhar Dhawan and Rohit Sharma set the team up with a good start with 32 and 43 runs respectively. While Sharma did not manage a century as he had in the previous ODI, he contributed a decent run total. Next up, Virat Kohli played on top form in the number four position. Kohli made a century, adding 104 runs to the total. This was Kohli’s 39th ODI century. There was some concern after Kohli fell but MS Dhoni along with Dinesh Karthik’s help ensured a win. Ambati Rayudu added another 24 runs. Dinesh Karthik added 25 runs in 14 balls, and MS Dhoni took the team home with a half century. Dhoni reached 55 runs not out, ending with a six. This was his 69th half century with a six. Virat Kohli commented that Dhoni’s innings were an “MS classic” with quick singles along with sprinted doubles. Kohli noted that Dhoni calculates the game well, and should definitely be a part of the ODI team. Virat Kohli, named Man of the Match, was pleased with the win, and the overall team effort. Not only did the team do well at the bat, he praised Bhuvneshwar Kumar for his bowling contribution. The third and final ODI is coming soon. The match will take place at the Melbourne Cricket Ground on Friday 18th January 2019. The upcoming match is the series decider, and the final game of India’s Australian tour.